Look no further than the US Dollar. I’ve been maintaining for the last couple of years that once the US Dollar found its low (it’s in a large fourth wave—a corrective wave), that it would mark the top of the US market. As per my graphic above, it seems like this bull market will never end, but we’re extremely close and it could fall over any time. 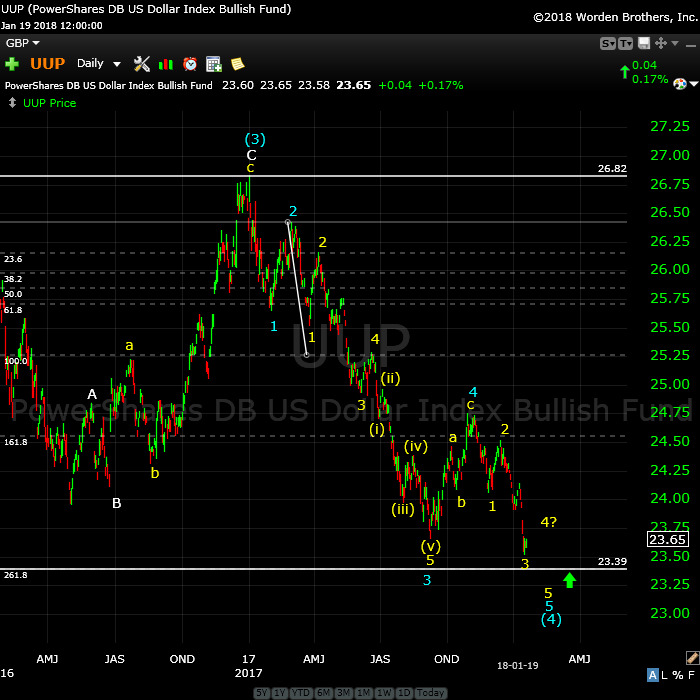 Above is the daily chart of UUP (US Dollar ETF). UUP is representative of the structure of DXY (the US index) and will provide an excellent predictor of the impending top in currency pairs and the US indices. On Friday, the US Dollar began to trace out what looks like a small fourth wave. I’m looking for a bit more upside on this before it drops to my target of 23.40, or so. This target represents a measurement of the length of blue wave one near the top of the chart and extending it 2.618 times that length. It’s a likely stopping point for this blue wave (4). The turn up will eventually lead to a new high. The dollar will turn with the euro, which is at a new high, and very close to my long term target. Now, with the US dollar at the obvious end of a fifth wave of a corrective fourth wave (blue circle 4 on the chart), for those who think there’s another wave 4 and 5 to go, where is it they expect the dollar to go? You only get 5 waves before a trend change. The counts are all in the fifth waves. 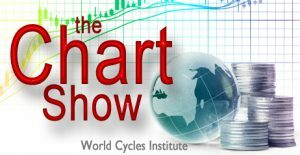 The movement of the dollar strongly influences the movement of just about everything else, so it’s important to pay attention to what it’s doing on a large scale. DAX is now virtually at a new high (a potential double top). AAPL is at the top of a small ending diagonal, at the top of a fifth wave. EURUSD and GBPUSD are extremely close to my long-term targets, the 38%, 4th wave retrace level. AUDUSD and USDCAD appear to have turned (with first waves arguably already in place). Oil is topping, or has topped already. Gold and silver are heading down with USDJPY. The VIX has also foreshadowing trouble on the horizon. We’re all set—we just need the trigger. Note that TSLA (yes, Mr. Musk’s baby, below) is sitting right at the 62% retrace level (352.60) after a corrective 3 waves up. Look for a turn down here, as I’ve been predicting. This highly speculative house of cards is foreshadowing our upcoming major bear market. In summary, everything is at an inflection point, or very close to a turn, but a little more patience is warranted. Above is the hourly chart of NQ (Nasdaq emini futures) superimposed over the same timeframe chart of ES (SP500 emini futures). For over a year, I’ve been talking about all assets classes moving more and more as one as we strive to reach the final high. Here’s an example of how tightly aligned the two major exchanges that constitute the US equities market actually are. This is the first time I’ve seen the Nasdaq and SP500 move in absolute lock-step. We’re seeing the final stages of this rally, as all assets move to a final high. To a lesser degree, you can find the same phenomenon across all major asset classes. There’s a very small gap now between their ultimate targets and present positions … right across the board. Above is the 2 day chart of Tesla. 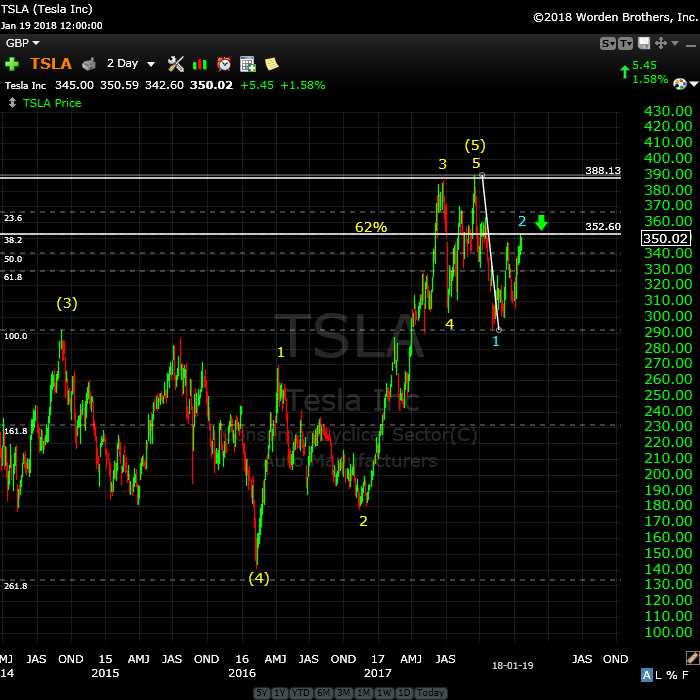 Tesla sits at the 62% retrace target as we wait for the turn. Blue wave 2 is corrective and we’ve completed a double top. The next move should be down. Last week, I suggested we’d head up in a “double-pronged” second wave, which is exactly what we’ve done. We’re getting ready for a turn down into a third wave. This weekend, I rebuilt the site, replacing all the WordPress core files in an attempt to quash the free blog. After spending almost all night at it, it doesn’t seem to have had an affect. I will therefore move forward to requiring all commenters to log in, starting sometime early this week (it will take some time to get this up). This will provide much more control over transient bloggers and protect all names and email addresses. It will also mean that once you’re logged in, you can comment at will, without having to include your name and email each time. I should have this in place in the early part of this week. There have been no material changes to my prognosis. We are at the high. I expect this final wave to turn down imminently. But, we may end up with a double top, so the first turn might not be the final one. Another frustrating week as the US Dollar tries to find its bottom. As a result, virtually everything has inched a little bit higher in yet another subwave of the 5th wave. Bearish financial advisors dropped to 12.7% this past week, the lowest level in 31 years. In other words, the bulk of them have given up and decided to go long—a perfect scenario for a turn. "Everybody's in!" We're ultimately looking for an impulsive wave down in the US indices (and a double top beforehand would be a very nice predictor). Again, we may get a double top so the first move down will be important to watch for clues as to whether it's permanent, or not. There will be tons of time to react; after all, this bear market will last years. So, while I expect the US market to start down this week, I would not be at all surprised to see a test of the final highs before heading down in earnest. Volume: It's dismal. Its the purple line, the top indicator at the bottom of the chart. Summary: The count is full for the US market in general, except for small subwaves that form the balance of a motive set of waves in SPX and some other major US indices. We're watching for a turn, which will change the trend and end the 500 year bull market. O.K. people, listen up. If they buy back the cash session and futures continue to tank… DONT BE A SUCKER!!!! CAPISCE?! haha … perhaps a work in progress! Exciting, nonetheless. Trump had nothing to do with it…. Why post it if it is irrelevant? who said it is irrelevant? I did. If Trump had nothing to do with it, it is! Great charts. I expect big gaps up in VIX and UUP still ahead of we only completed a third wave today. you have missed the nuances of my charting…………………….the lower trendline is exactly where it should be. it captures the low of wave 1.
w3 was an overthrow of the trendline – typical behaviour of a w3. today’s overthrow is potentially “also” a subwave 3, so the overthrow is acceptable. notice the price level for today’s DXY candle. it overthrew the trendline, and it crawled back …………”into”………………… that very same trendline. this shows me that the trendline is in the correct spot. it is also triangulated with the “dotted” lower trend. once a trendline is established………..i would rather toss the chart to the rubbish bin of …………”charts”………….. than “adjust” trendlines…………. Volume on UUP today absolutely massive. But is it the bottom or just the end of (3) of 5? it’s all about energy spike downs not the news or earnings etc. my comments on the dollar are valid . the trend is down . I see no other way to count it . im looking at the monthly chart , not a daily or weekly . and the wave E drop could be monday . yet i wont argue the wave count. yet march 1st is it in my big picture. we will see what the market does . its monthly wave count target . I am not sure why Peter T has what he has labelled as a fourth wave down as a five instead of a three, so as currently labelled he has an impulse down for his larger wave four instead of a corrective three. I take it from your argument that you consider the Jan 17 USD top as fifth wave and not as a three is Peter T has labeled the UUP chart. I am not sure how you see it in relation to the 2008 top. Personally I have not looked very closely at a long term chart of USD so I cannot state with any confidence what degree the current wave is that we are seeing. My position on a deflationary depression ahead with a rising dollar remains firm. Ordinarily even if we had a corrective wave in USD ahead, which is your position, it could take the form of an expanded flat reaching to new highs so that would not necessarily negate your long term bearish view of the dollar and viewpoints would not necessarily be mutually exclusive it seems to me. However, if you think this is the first wave down of a new developing impulse clearly the dollar cannot exceed the Jan 17 high as that would invalidate your wave count. Finally, I also measured the dollar’s move down today and it perfectly met the measured move from a small H&S formation. thanks joe…………………… by all means………..zoom away…………….it is my privilege when you zoom…………………. i learn so much when i study your charts…..
Keep in mind there is a cycle low due in early april . a clean weekly wave 5.
the weekly chart is not a completed wave . Is this an elliot only site? i have posted on here several times that i only watch currencies from a distance. wave of an expanded flat then yes new highs in a 5th wave . here is my wave count on a monthly chart going back to 2001.
i updated it on at major turns so don’t think i watch it all that closely . i look at it usually about 2 times a month . retrace . if that fails then re consider the wave count . or B wave completes near that .618 retrace. you are correct, a break above the jan 2017 high will be the deciding factor. are helpful yet the wave count will always stand on its own despite any indicator. leg down of a longer term trend. for alternates which im not going to get into at the moment . Got it! That makes perfect sense as you see that last high as a corrective abc in a down trend. Thanks for the chart. I am atrocious at correctly counting waves! obviously inverted…could the current time frame mark a top of significance? i have no argument with peters wave count . from 2001 to 2008 as a 5 wave move . decades . so ill deal with that in the future . my count shorter term matches peter . high in the us dollar is exceeded it invalidates the count plane and simple. for now ill stick to the monthly chart as well as the weekly . does fit into this . nothing else to say other than its a long term view to consider. Joe, thanks for the USD chart. Using EW, your count is just as good as anyone else out there because as long as someone is following the basic rules of EW when making a count, interpretation of market direction and personal bias lead 2 different people in 2 directly opposite paths. This is the enormous flaw in using EW and it leads some people in making “predictions” of future prices instead of “reacting” to what price is doing. That is why you can get 5 people in a room and all can follow EW rules, yet they all can come up with a different count. For myself, I will look at wave counts (as well as many other things) to try to get a general macro idea but I leave it at that. My entries and exits are based on price alone and I have learned (the hard way) to block out opinions and predictions. Also I have set rules regarding position size, risk management, etc. and a system to try and keep my opinion and biases out of the way. In reading your posts you seem to have a lot more than EW to make your decisions and seem to really do your research. A lot of different ways to trade for people, just have to find the one that fits the best. Thanks for your contributions. True. I have never before seen anyone label a third wave in threes so I know there are some things I don’t understand about Peter’s approach. I was under the impression that third waves unfolded in fives, not threes. top. i did change my mind yet i can relate to that chart your showing. im on the same page as you. right or wrong that’s what i see. $VIX : $VXV closed @ < 0.91 @ 0.8465 .. the one I keep track of is $VVIX 1st — rest of VIX'en familia come 2nd, 3rd, etc. Jan 30 – 31 also FOMC day — think rate hike already factored in. 4got to add this astrologer — most likely most of you are aware of him ? am on his freebie email list. he’s expecting a considerable correction MAYBE … NEXT week. as to OIL ? don’t really know but 67. being resistance ? then comes 74 area. if not we see 59 / 55 area. UUP — guess many know it made today a NEW 52wk low of 23.08 & DXY made a NEW 52wk low of 89.16 b4 ‘recovering’. I don’t follow news at all.. just price action and fibonacci along w/my indicators, etc. you are correct about the Solar eclipse before Lunar. • March 22 – April 15, 2018 In the fire-sign of Aries. • July 25 – August 18, 2018 In the fire-sign of Leo. • November 16 – December 06, 2018 From the fire-sign of Sagittarius to the water-sign of Scorpio. I like those dates you got, Joe ! 🙂 I feel March 21st (GANN New Year’s Day) — around that date will see the 3% correction. that’s MY take. 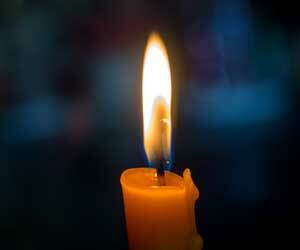 rest – consider minor (for now). thanks for the dates, Joe ! “Ben”………….for the public record……i will adjust the trendlines to a triangle, because there is no humanly way to “pre – establish” perfect triangle trendlines.. Some folk may think the discussion Joe and I are having over the dollar’s fate is entirely academic but nothing could be farther from the truth. What you expect from the dollar will probably exert a huge influence of how you position your long term portfolio, and wittingly or unwittingly, you are either in the inflation or deflation camp. Those of us expecting a crushing deflationary cycle ahead are of that opinion owing to the gargantuan size of global debt, now probably many multiples of global GDP. One only has to look right here at home at the fiscal state of the US, corporate and government. Most of that debt will never be repaid. It is not possible. If you accept that premise, and fair enough if you do not, then you must grant the the debt will be defaulted on. One example that quickly comes to mind is the state of the fracking industry, with over 300 billion of bonds outstanding. This industry was not profitable when oil was 100.00 per barrel. Does anyone think it is now profitable with oil at 60.00? It does not matter where those bonds are now trading, their true value is zero. It is only a matter of time. When governments and corporations default on their debt, this results in destruction of the currency in which the debt is denominated. That amount of the currency literally vanishes! The notion that the debt has a commensurate counterpart in the form of some kind of asset is BS. In the case of government it is taxing power, and we know revenues evaporate during recessionary times. In the case of corporations it is stock value which is linked to earnings and they have the exact same problem in an economic downturn. Unless you are prepared to argue that central banks have managed to abolish the business cycle, it is impossible to avoid the conclusion that massive defaults are coming. Look at Detroit. Look at Illinois, particularly Chicago and the miserable state of CPS. Look at California and the CALPERS retirement fund, billions in the hole, even if you trust their ridiculous and lying stated rates of return. Folk, this thing is a monstrous catastrophe waiting to unfold, and believe me, it will. I am not even going to talk about the leverage and duplicity of central banks buying of equities to freakishly distort capital ratios and allow companies to borrow insane amounts of money to buy back their shares when they are the most expensive they have ever been. But you get the picture. I certainly agree that inflation is eventually coming, with the result that what remain of dollar value will shrink to a fraction of what it is today. No question. But the thing that will usher in that era is a massive deflationary depression and I do not see how that can be avoided. I am truly interested in hearing what others on the forum think about this debate, and would love to hear your perspective. Thanks! I believe you’re 100% correct in what you just wrote, but until (for me) a couple of trend signals fire short, fighting CB’s is a less-than-worthless endeavor…. They know if they ~ever~ stop buying/supporting markets, It’s. Over…. Even as fewer and fewer people see value in the market (my theory as to why volume continues lower over time), momentum reigns, CB’s have no incentive to stop doing what they do…..at any price…. They can print forever (doing whatever it takes), so they do….. So, until it blows up, they keep going. ~Can’t~ stop, ~won’t~ stop…. Market gaps up open every day… At this point, seems that opening lower for even ONE day strikes fear in CB’s…. So yeah, (in my eyes) it’s Just. That. Close. to blowing up…. And that’s why I come to this site… Peter’s is the only one (I know of) that’s talking about the peak of a 500 year cycle, which makes some sense to me, because, if CB’s are ~this~ afraid to stop supporting markets, every day, still, after all these years……..one mis-step and how can anything OTHER than a crash occur, destroying ALL of the liquidity/free money sloshing around? Which means huge deflation, and stronger demand for fewer and fewer dollars…….UNTIL the Mother-of-All reflation occurs….. Which pretty much ought to destroy everything left…. !%&#%^*# Central Bankers…. Soooo determined to avoid normal corrections, and normal business cycles, they’re gonna wind-up burning it allll down…. …………ok…………………….. i confess…………… i DO wear white pants “POST” labor day! Dow, ES and SPX all look to be topping right now.. A violent turn should happen if correct..
Been hearing that for months and months, even years. It will top when it tops. In the meantime, fortunes have been made following the trend, not fighting it. And stops are continually moved up in a conservative way to protect gains. Sure Ok. You might want to lay off the sauce during market hours. He makes a good point Ben. Peter’s site and one other is the only place i post these days because both hosts maintain some semblance of civility. I think we can have lively discussions from different points of view without ever resorting to ad hominem attacks. yes………………i get it……………the whole “wolf” thing……………… cryin’ and all that…..
ok………………get over it…………………… “BE WARNED”! yes………………… i rejiggered the dark red channel……………. i blame it on my ……”tormented”………….childhood!! I have to give Martin Armstrong his due. In the midst of a correction in the summer of 2011 while the DOW was hovering around the 200 DMA trading around 11,000, he forecast the following 3 levels in the coming years: 1st stop 18,500, if the DOW broke that then 22,000-23,000. If it cleared that then 38,000-40,000. It was very hard to believe even the 18,500 number at the time given we were only 3 years removed from the meltdown in 08-09 much less the even absurd higher levels. Not only did we get to 1st target almost to the tick, but we had a several month stall and correction there. Of course the market blew right through the 2nd level. Pretty good I would say. Currently he sees major resistance at the 27,500-28,000 level where odds are the market finally corrects for a while before the last push up to 40,000. So far, he has been dead on. Pretty amazing the reasons he has explained why this is happening. Has nothing to do with conventional market wisdom. He is also calling for a blast off in the US$ to as high as 140-160 over the next 3-4 years. World capital flows will hide in the $ and liquid blue chips while everything else is melting down. so…………..”martin” is also calling for the “blow up” of the treasury market……. can you please tell me………….”HOW” is it possible for the treasury [bond] market to blow up – BUT the US Dollar is bid to new highs??? bear in mind, we are in a new world of the petro yuan and soon to be petro ruble??? was THAT predicted by martin in 2011???…………………………….. I think what you are referring to as the treasury market blowing up is rising interest rates? If so, yes he is predicting the bull market in treasuries that began in early 1980’s is ending after a 35 year run. Seems reasonable to me. As for the question of did he predict the petro yuan or ruble – not that I am aware of. Ben…cherry picking Armstrong’s commentary is a bit disingenuous…on January 1, 2018, what did Armstrong offer as his expectations for 2018, specifically the “first half of 2018”? Further, when is the “no sooner than” time target for the 40,000 level? Armstrong has stated that the 40,000 target could not occur prior to a specific time frame…”no sooner than” are the words used by Armstrong that is why they are in quotes…on January 1, 2018, what did Armstrong offer as his expectations for 2018, specifically the “first half of 2018”? Have no idea. Maybe you should contact him. You might learn something. “Have no idea.” We already knew that! Poor rotrot. Someone gives Armstrong a compliment and he got his feelings hurt. lol. What did Armstrong do to you rotrot? You been mad at him for a long time? it isn’t about Armstrong…it’s about knuckleheads claiming to know something when in fact they “Have no idea”! prima facie evidence you are a knucklehead…LOL! where is the “fun” in that?? the details become the picture……………i mean, sandcastles are really built one grain of sand upon another…………..
To be perfectly honest with you Ben, at times I have my doubts. What I can clearly see is a global cohort of central bankers who are intransigent in their determination to flood markets with liquidity world wide. I used to get irritated when dullards would make snide remarks about “conspiracy theories” who by their very comments, display a stunning level of ignorance of what has been happening as regards the destruction of price discovery in equities markets. Even for the ignoramuses, I don’t see how you could have missed all the market anomalies if you were an actual trader, as opposed to a clueless talker. I used to make it a policy to ignore stupid people but I recently wrote an article in which I encouraged naysayers to go to the CME website and search the CBPBP available information. This outlines the so-called Central Banks Preferred Buyers Program. I have had more than a few people contact me and tell me how completely stunned they were by what they discovered. But this it the problem is it not? I have absolutely no doubt that they are not being fully transparent, even with the mind-boggling information they do reveal. I think the leverage is far more egregious than they admit to, and as everyone knows there is no accounting whatsoever of “dark pools” liability. The bottom line is we are looking are extremely distorted markets, with enormous hidden risks that have nothing to do with price levels of indices. Agree with you 100%. You are dead on. Watching the VIX to confirm the top is in. Should be really really close! saw some comments come down my email. am familiar w/some of your thoughts. but one thing I’ve learnt is that STOCK MARKETS are NOT…THE economy. used to buy into that when I first traded and realized later on — that price action & Fibonacci levels, along w/some indicators (which most state, are laggards…that is indicators). * watching 2850-2880 closely. If market hangs around this level during 2018, expect 5-10% pullback this year, but no correction until next. * if S&P shoots up to 3,000 in the near-term, expect 20% correction. * 3rd wave started in 2010. Expect it to top at 3222. * 5th wave to top in 2021-2022 at 3500 – 4100. * once top of 5th wave reached, expect substantial decline to 1500 – 1800 under best case scenario, but more likely 1,000, and for a 10-20 year bear market. Previous Post: A Full Count Next Post:Way Too Much Bull!